I think is missing is the "Invert Selection" option! In Quad-Directory-Explorer it is very easy to select, deselect or to do a invert selection of files or folders! [CTRL + A] = "Select All"
[CTRL + A + SHIFT] = "Invert Selection"
This works in every explorer view of q-dir. Please always use the latest version of ... 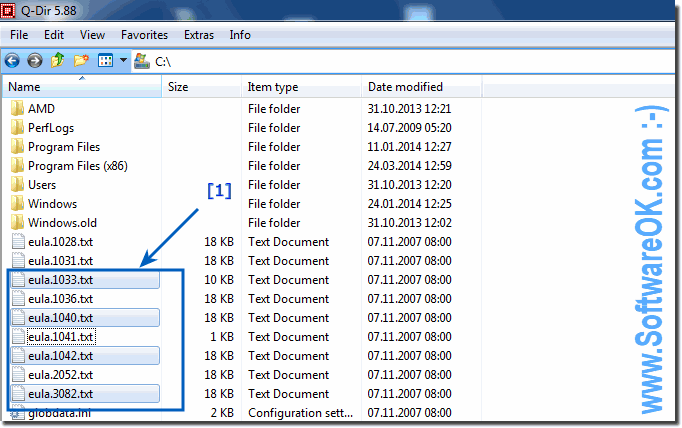 The Windows Filemanager Q-Dir! (Image-1) Select files in Explorer view! Q-DIR - FAQ-44: I think is missing is the "Invert Selection" option! How can i change the colour of the header bar of the active window? How to change the background colour of the active explorer pane! Hello, I really enjoy using Q-dir. One thing that I think is missing is the "Invert Selection" option that is available in Explorer. Do you have plans to put this in? Thanks!